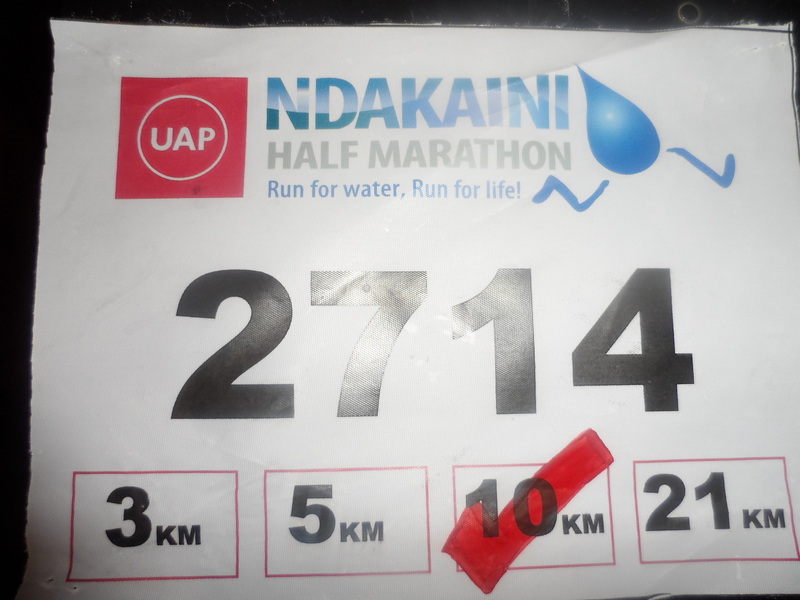 So, our friend Jules told Nas and I about the UAP Ndakaini Half Marathon because we had bugged her to take us jogging here. Seeing as we had already been doing C25K three times a week, it didn’t seem like it would be a great stretch. I also walk from Adams to Kawangware through Dagoretti (about 10kms) once or so a month so I am not a novice to long distance movement. So I got Hipilicious and Skinny excited about the marathon and our cousin Jumwa agreed to join us for the same. Hipilicious and Jumwa started walking from Westlands to BelleVue every other day in preparation for the marathon. Skinny (who used to run in school) said she was participating for the money, she was going for the monetary prizes. Her theory was to hang on to the ultra marathoners at the starting line and overtake them near the finish line. She also prepared for the marathon by eating bananas. On Saturday morning, I woke up before 6am, which was a struggle by itself because I went to sleep at about 1am. I had hosted Masha and the girls for a sleepover and I had to prepare a heavy breakfast for us to have before leaving for Ndakaini. 5. Ensure that the intervals app is in perfectly good working condition. We got to the venue and while parking was a problem, God opened a door for us to park at some church. Thing was we didn’t know that the church was over 3 kms from the starting point. Thank goodness for Double M’s! We got a ride to somewhere near the starting point and were there 15 minutes before the start of the race. Hmmmm! Nas and I had a strategy. Since we can run about 27 minutes straight and this gets us very tired, we agreed that we would run in short bursts mixed with walking. 5 minutes walk, 10 minutes run. 5 minutes walk, 15 minutes run. 5 minutes walk, 10 minutes run. Hipilicious’s strategy was just to finish the race. Jumwa’s strategy was to keep Hipilicious company and Skinny’s strategy was to keep up with the ‘Kalenjins‘. GUN SHOT. Chaos. Jumwa and Skinny disappeared with the mass of runners. Nas was nearly knocked over by the ambitious runners. Hipilicious was laughing hysterically because Jumwa had taken off like that without her so she knew she was going to be last. Nas and I synchronized our apps and off we went. Walking. With Hipilicious. And the crowd was moving further and further away from us. Hmmmm. Nas, maybe we should start the jog now? I think it was pressure from the other runners. We didn’t even finish the first walk interval of 5 minutes before I got so tired! 🙂 And my shoe lace became undone. Why did I wear those running shoes and I hadn’t worn them in like 4 months? So the end of me began when I stopped to tie my shoe laces. Hipilicious and Nas went on jogging at a steady pace. By the time I bent down and tied my shoes, they were climbing the first hill. Let me just say it now. I never caught up with Nas. Before we hit 2kms, we caught up with Jumwa. Who was so upset that Skinny had gone ahead with the ultra marathoners that she decided to keep to her promise of sticking with Hipilicious. So it was Skinny leading, then Nas then Jumwa with Hipilicious and last was yours truly. Something should have clicked in my head when I saw Skinny carrying her camera to the race. I found her just after 3kms taking photos of the water/river that we had to cross as part of the course. I just smiled and walked past her. She said all this and much more and it was really hard to keep breathing and listening to her talk so I was glad when she said that I could go ahead and put on my earphones….. I decided to jog abit and got to one of a thousand crazy hills. She caught up with me when going uphill. I passed her the next time we were going downhill. Then we came to the mother of all hills. I have never walked up such a steep hill, save Mount Longonot. And the sun had come out with all her babies and grandchildren. My unused shoes were killing my feet. I could have fried an egg at the top of my head. And that hill was not ending. This was where I caught sight of Jumwa and Hipilicious. That hill was killing them too! I can’t believe that I am still alive and I can talk about my ordeal. That course was HORRIBLE. It was crazy. I have been in pain since Saturday. I couldn’t even walk straight. And Nas finished the course in a cool 1 hour and 30 mins. I am so jealous of her. I took 20 more minutes. And didn’t stretch after that so you can imagine what my muscles feel like! I nearly wore slippers to work today. There is no way I was going to survive while wearing these. Anyway final rankings: Nas, Hipilicious, Jumwa, Skinny and I proudly led from the back. 4. Keep to your pace. I got too tired because of trying to run as others. If I had kept to my normal pace, I might have made a better time. 7. Just because I can do 27 minutes of jogging on flat ground doesn’t mean that I can do 2 mins of jogging uphill! 10. Nas is a much better athlete than I am!